Anyone else having issues downloading? This guy says that he can't load Tripod with his best save, which bums him out. I told him to send me a message with all of his save info so we can debug it. If I then I skip everything at the beginning, the card game runs perfectly - but the game menu usually has blocky letters for a few seconds until it loads. Yes that sounds like hashing errors. The hash algorithm needs some work, Ill try to work on it soon. 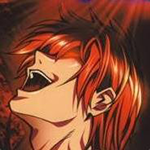 There's a guy on the steam forums that says his game is crashing whenever it tries to sync with SE servers and the trophy icon doesn't seem to show. FYI - He didn't give any more info. Sounds like he's crashing every time he gets an achievement. Not sure if there's a way to bypass/turn off syncing/ or if disconnecting from the net would help, if anyone has any other theories, I'm all ears. Ok I have installed Tonberry and everything looks fine, but the cam movement on the world map starts to stutter. I don't know if there is a FPS slowdown, Clouds (force of habit) Squall's animation looks as smooth as before. Another thing I have noticed is that the games internal renderer is locked to 720p. While I have seen that DSfix for Darksouls can change this and your program is similar to it, do you think you can implement something to change the internal resolution? It's not urgent the game looks pretty fine with a good AA in the correct 720p resolution (I use Nvidia's FXAA with 8xSupersample - yes I disabled both to see if this could causes the stutter). The memory needs a better management. It would be good to have some kind of a prebuffer which loads nearby scenes in the memory and unloads scenes if not needed (I can imagine that this could be a lot of work to find a way to define what is nearby and what isn't). The menu stuff should have it's own memory and should never be cleaned. The world map: I believe that hash algorithms isn't suited for it very well, it feels like as if Tonberry wants to update the textures with every movement of the camera, the strange thing is that there aren't any textures to update yet. The battle: well we can't say anything yet, but I believe that the magic should be handled similar as the menu and should be loaded in a prebuffer. Well this are only suggestions of one who has no idea how everything works but I hope that one or two points may give you a good idea to improve the tool a bit further. And then you get an unhandled exception. It makes first playthroughs rough. Hopefully it's a hashing problem that's easy to fix. I think that if the game is pulling up the achievement window and tonberry tries to replace a texture at the same time, the texture fails to load.. which sometimes causes a nasty crash, and other times just makes you lose text res or some other res for a while. These suggestions are win. I think if the menu had it's own memory and loaded seperately, that it would eliminate the crashes when people get achievements; but that's just conjecture. Hi guys. Long time lurker, first time poster here. I've been following this topic closely for the past few days and jumped on the first opportunity to test some of the mods created with Tornberry. And as expected I got bugs by the trunkload. But I seem to have found a work around for the synchronization crashes, too. You can check pretty much most of the bugs I've found on this album, as well as a printscreen of my task manager while the game runs. I didn't encountered problems with the game overusing RAM like our other friend did. As for the synchronization crashes: I ran into this problem the first time, bugged fonts and all but I soon realised that this only happened if the game tried to sync the files before I opened the steam overlay. The overlay pops up, takes forever to finish loading, but after that the game seems to be able to handle the synchronizations without crashing. But the game did dropped the mic and Peaced Out when I tried to open a browser window. Ninja Edit: i just got an achievement (Blue Magic Master or something) after doing my Overlay shenanigan and it synched with the server fine, but didn't showed any message on the left corner of the screen. Not-so-Ninja Edit: It seems it was too early to state that I wasn't having memory issues. My game is running on Tornberry, Tripod, Seed Reborn, and Roses and Wine. I also installed Aali's driver but I don't know if it's working as expected. I would also like to thank Mcindus and Omzy for the great work. All you guys, seriously, thanks for modding the game and generally fixing Squenix's potato ports. You can reach the limit of the ram even if it isn't full used. See Fixed-size blocks allocation and this too: http://en.wikipedia.org/wiki/Fragmentation_(computer)#External_fragmentation. If the memory suffers from to much fragmentation then a crash is very likely. And I think that it is what we are currently having. The menu is always used so it should be in its own memory pool. The same counts for the magic and effects, they are used randomly but constant so this should have it's own pool too. For the field I would possibly create five or six pools, one pool is active and has the data for the current scene and the other four have the data for scenes which are next to it. When the scene switches to another, the active pool becomes inactive and the pool with data for the new scene becomes active. After this all inactive pools will be cleaned and the nearby scenes of the current scene will be loaded in them. Thanks for all the bug reports--I expected some of these issues to arise based on the way Tonberry works. Steam's overlays use the same technique of directx interception that Tonberry uses, meaning that any time steam interrupts the game with an achievement or anything else, unexpected behavior will occur. I am not sure yet how to fix this. If anyone knows how to bypass achievements or syncs, chime in. Save files could potentially be modified as well, but I don't know much about that. I'll look into them, but I may need some help from someone experienced in C++. If anyone (maybe Kaldarasha?) would like to help make suggestions/edits for my code, I'd love to have the help. I can send the source files to interested individuals. I've tried to keep it relatively condensed and its not all that many lines. My next priority. I plan on rewriting the hash algorithms so this kind of thing happens less. I still have yet to discover why some summons lag. Please keep reporting them--I think all issues mentioned so far fall into the categories above. I have a lot going on IRL for the next month, so updates will not be as quick as they have been, but that doesn't mean I'm not going to be working hard on it. Over time, with community help, we should be able to resolve all of these things! One way to bypass this is, make it already achieve all achievements then it won't ever pop up again. There is a tool (Steam achievement manager) aka S.A.M which can give you all achievements on that game. Really simple just select the game and press achieve all achievements.. Something like that..
Accidentally leaving SAM open is pretty much asking for a VAC ban next time you log into a VAC-protected game. 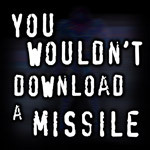 It's highly advisable that players do not even put such software on their computer, and even more advisable not to bundle it or run it automatically with something else. 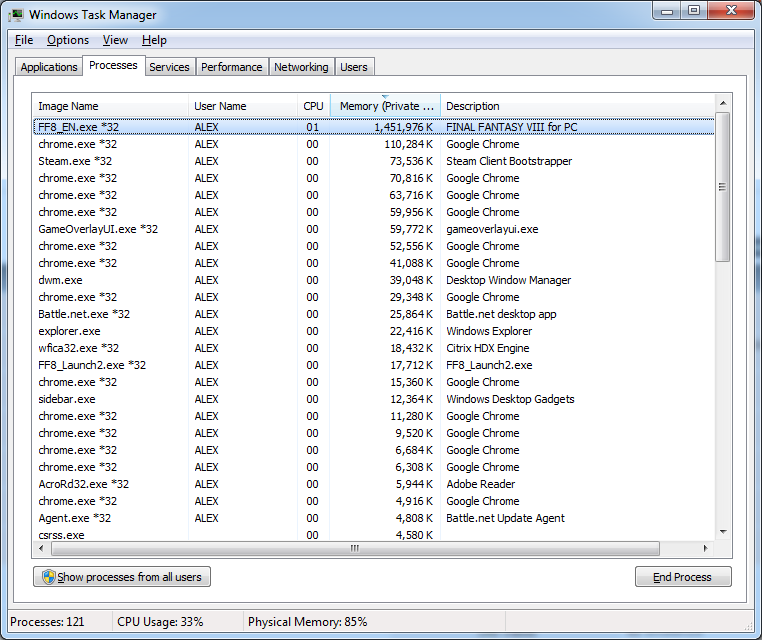 I'm currently testing for the memory fragmentation theory and it seems to be it. The game quickly builds up on RAM usage but when I run my optimization tool it's memory usage drops back too ~7mb, so as a workaround I think one could suggest running a RAM optimization tool like RAMRush alongside the game. RAMRush has a keyboard shortcut (ctrl alt o) so you can launch the optimization from inside the game, but that's just the first Ram optimization tool I found so there might be better tools around. EDIT: =/ guess what hapened when the game's commited RAM reached about 1600mb. You can just deactivate the overlay (and Square's synchronization thing too) by right-clicking the game on your Steam Library and going to Properties. And using SAM won't solve the problem. If somebody sends you a chat message or one of your steam groups posts anything your game will crash. Now, into something new: one really curious thing happened, until a few hours ago the overlay was working alright, but now it loads the first few layers (the first few boxes and the name of the first person on my friend's list), and then the game crashes. It's the same installation that I was running before, so what changed? Well, some hours ago I was "working" from home so my Steam was set to Offline and thus wasn't loading my friends list. I've set it back to Offline now and the overlay works fine. I installed tonberry in my folder, but when I hit play I get "An unknown exception has occured" as soon as I hit the play button. I have no custom textures in the folder so this is a completely new install. Downloaded the v1.2 Hash and extracted it to the correct folder, but the game still gives me the same error. I tried putting in custom textures to see if that would work but no dice. Tried removing all Tonberry files from the Steam FF8 folder and the game launches fine, so it must be something with Tonberry? I also have RaW installed but that works perfectly fine without Tonberry. Sadly I haven't learned programming (yet). I have found a good German side with tutorials, so one day I surely will write my own programs. Maybe a C++ Community could help you. (http://cboard.cprogramming.com/cplusplus-programming/). Thanks for this Alexios--it is really helpful. So you're saying that to avoid all steam overlay issues, you can deactivate the overlay in your Steam Library. This should be considered the permanent fix unless another way is discovered down the road. Please let me know if this works for you guys. I will also look into memory management and caching local areas. I did build a cache in the current release that stores up to the last 100 textures and since each texture is a couple of megs at least, you might expect memory to get up to 300MB, however 1600MB should definitely not happen so I will need to assess that. I think caching menus/battle/world map textures is a great idea Kaldarasha. *Remember, if you are seeing weird unpredictable things like random textures popping in where they shouldn't, that is a hashing error and that is my next priority. First of all thank you for these mods! I got the game on the recent steam sale and couldn't wait to try this out. I'd like to help out but i'm not very tech savvy. Anyway I'm also getting unknown exception crashes. If I watch my memory as a play I noticed every time there is any kind of scene change, (going from one area to another) or simply opening or closing the menu it adds to the memory on the process. Using ramrush did seem to alleviate the crashes a bit, though they still occurred. As for the overlay I just disabled it and haven't had any issues. I hope this helps somehow. Anyway, great work! I love that my favorite FF is getting modding attention. I followed all directions to install Tonberry but it still won't work ;-;. Same here "an unknown exception has occured" as soon as i put Tonberry in the FF8 folder. Hey everyone - Alexios found a workaround dealing with the overlay. Pull up the overlay (shift+tab) before you get an achievement while you're in game and you can avoid the 'unhandled exception' crash. This only works if you put yourself in 'offline' mode, but still allows you to get achievements. Hint: before getting a new GF, first time you beat the game, etc. Thanks to Alexios for the workaround! Hope this helps for a little while until we get some things sorted out! Like I said before, opening the overlay before you get an achievement/synchronization only works if you're offline. At least for me. Can you try oon your machine and see the overlay behaves differently for you? Well it is a permanent fix if you deactivate the synchronization too. But if you just set your status to offline you can use some of the overlay features and make full use of the synchornization of achievements and savegames, which is a way better solution than turning everything off.